Home » News » Are You Ready For Uncivil War? Guitarist/vocalist Scott Owen (SUBVERSION A.D., ex- ELIMINATE, ex-HIRAX, ex- PIRANHA) and drummer Joe Cangelosi (BROOKLYN MILITIA, ex-ELIMINATE, ex- WHIPLASH, ex-KREATOR) have teamed-up with bassist Rich Day (BROOKLYN MILITIA , ex- PRIMAL SCREAM, ex- WHIPLASH) to form the new thrash metal outfit, UNCIVIL WAR. The timeline for this union dates back to almost two months ago when both Scott Owen & Joe Cangelosi mutually parted ways with ELIMINATE, who will still be fronted by vocalist Don Doty (ex- DARK ANGEL). As per both Scott Owen and Joe Cangelosi, the explanation for leaving ELIMINATE was the desire to write, record and perform new music. At the current time, ELIMINATE are only performing songs from the two albums Don Doty helped write and record with DARK ANGEL, namely We have Arrived (1985) and Darkness Descends (1986). They have both wished ELIMINATE good luck in the future as all parties involved move forward. 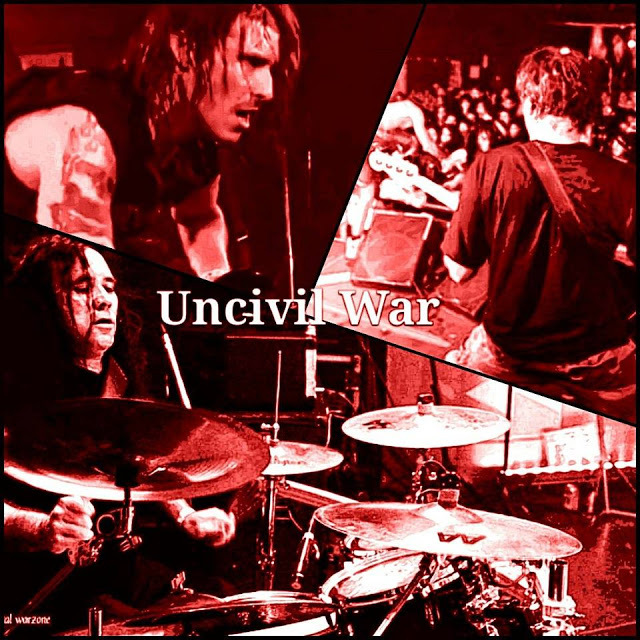 At this point in time, the respective members of UNCIVIL WAR have all recorded their parts for songs for an independently-financed demo in locations both in Texas and in New York. The demo should be finished by April and mixing will be done at that time in New York. Upon completion, it will then be submitted to various record labels for securement of a recording contract. Joe Cangelosi recently offered this comment: “We are excited to finally be writing new original music in the old school style we came up playing…it’s time to thrash!!!!!!!!”. Joe has also just finished his drum tracks for the upcoming REAPER METAL ALL-STARS benefit release in aid of GRIM REAPER vocalist Steve Grimmett. The 7”/digital download will also feature noted metal musicians Gary Holt, Chuck Billy, Bobby ‘Blitz’ Ellsworth, Doro Pesch, Glenn Drover, Todd La Torre, Mantas, Tony Dolan, Neil Turbin, Lips, Ross the Boss and John Gallagher.